More refugees from Manus have been flown for resettlement in the United States this month. Forty from Manus left on 23 January. Another 18 from Manus, and more than 130 from Nauru, will fly in February. This will bring the total to just 230 people resettled in 14 months. The process is unbelievably, excruciatingly slow. In comparison, Canada resettled 25,000 Syrians in four months between November 2015 and February 2016. Hundreds of refugees have been left wondering whether the US deal will ever apply to them. Trump’s current travel restrictions ban or limit people from Iran, Syria, Chad, Somalia, Libya and Yemen entering the US. Although there has been no official explanation, it is painfully obvious that there are no Iranians or Somalis on the next flights from Manus or Nauru. Iranian and Somali refugees on Nauru protested on 22 January against the resettlement delays and their “temporary” exclusion from the US scheme. But there were no answers to their questions. Another protest is planned for 29 January. What is certain about the US deal is that there are hundreds more refugees on Manus and Nauru than the US has agreed to resettle. Yet the Turnbull government has again point-blank rejected the offer from New Zealand to resettle 150 refugees a year. The uncertainty on Nauru is taking its toll. Alongside the despair, there are more bashings; more robberies; more Border Force vetoes on urgently needed medical transfers off Nauru, punctuated by emergency medical evacuations. There are growing signs of the move to consolidate Nauru as a long-term offshore detention provider to the Australian government. A new state-owned company, the Nauru Regional Processing Centre Corporation, has been set up to “manage service contracts” in the camps and settlements, to ensure that the largesse of the Australian government contracts will go directly to the Nauruan elite. Some refugees will get to the US—but only after many more months of the hell on Manus and Nauru. There is still an urgent need for the refugee movement to maintain the demands to evacuate Nauru and Manus and bring all the refugees and asylum seekers to Australia. Three months after the brutal siege of the detention centre on Manus Island, nothing is resolved. Hillside and West Haus camps are still unfinished. East Lorengau is over-crowded. Health facilities are inadequate. Mental health treatment is non-existent. In mid-January, Hillside was blockaded by local Manus residents because of the stench and health concerns caused by an open drain carrying sewage from the compound across their land. 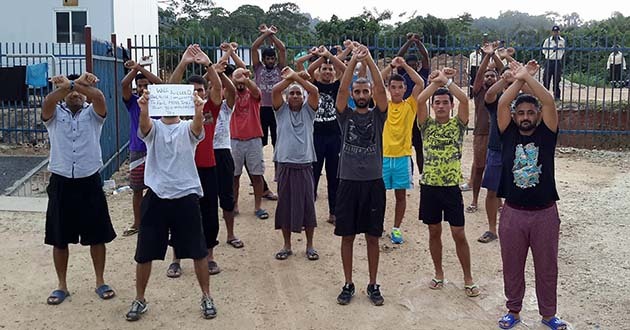 With the refugees no longer on the naval base, they have now become hostage to open squabbles between local landowners and Australian government-favoured companies with detention contracts worth tens of millions of dollars. Tensions on the island have spilled into the open over the past few weeks with local landowners and companies blockading the three detention areas to try and force the Australian government to give contracts to local companies. Paladin guards were driven out of Hillside on 15 January by the local security company, Kingfisher. Paladin Solutions has an Australian government contract for $72 million to provide Manus “garrison services” (overseeing the detention camps) for just over four months. No wonder Peter Dutton is refusing to release the details of the contracts to the Senate. Dutton claims releasing the information would damage international relations. More likely it would damage the government’s credibility. Offshore detention is a multi-million dollar scandal. But while security companies are paid millions, the Hillside asylum seekers have not been paid their promised allowance since they were forcibly relocated there in November. After an angry protest by asylum seekers in Hillside, Border Force has opened a canteen. But while Paladin is being paid $585,000 a day, asylum seekers are getting just 15 points a week (about $7.50) to spend at the canteen. 24 January was the 175th day of protest on Manus. And the protests will continue.